What comes after AIDS ? Exactly, DEATH ! The Melkweg couldn't think of a better fitting program on this rainy Thursday night. 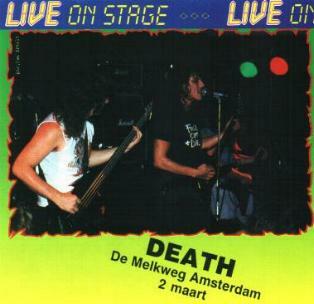 After the musical "Aids" the night gig of Florida's most extreme starts, Death. I am very worried beforehand. Not because of the toilet seat in the Melkweg (I read the Aids brochures carefully), but for the live sound of Chuck & co. Just like D.R.I. and Suicidal Tendencies, Death delivered a great thrash album last year (the obliged "Leprosy"), But the first two bands couldn't fulfil it at all on the Amsterdam stages. Will it become tendency that live achievements can't keep up with those on vinyl? How big will the contrast be between the sublime sound of top producer Dan Johnson (also responsible for the great sound on "Leprosy") and the, devoid of all the studio ingenuity, live situation? Thank God it exceeds all expectations. Death's performance even can be called a classic example. The songs are being played very tight and almost without mistakes, with some rough edges and a few little improvisations that make a thrash gig so exciting. Right from the start with "Zombie Ritual" Death stands like a (haunted) house. The rhythm section of bass player Terry Butler and drummer Bill Andrews make a solid base, rumbling imperturbable, like a train, and almost negligent carry out tempo changes. Tight riffs and filthy, Kerry King like, solo's come out of the droll little round cask by the name of Rick Rozz. But above Death spins around "evil" Chuck Schuldiner. Not only the creative brains behind this band but also attracting all the attention on stage. Very impressed I am by his accurate performed solo's, speedy rhythms and plain shattering is his famous grave voice. Be aware of imitations, there's only ONE Chuck! The audience also knows and chants his name fanatically. He can tell me over and over again Death is a tight band achievement, to me it's Chuck's show. As the blood curdling "Pull The Plug" is being released at the crowd, the night can't go wrong anymore. Not even as the too small stage and overactive security men make stage diving impossible. What the excited thrashers don't know about is Chuck's throath problems. Medicine don't help anymore and the set after one hour, despite of a heavy "we want more", had to be closed. That hour yet was so intense, that Death did have enough time to leave an unforgettable impression behind. Where the definition death metal came from is clear once and for all !! !